A tiny, almost untouched 100-year-old cottage with its original toilet and bath still under the house will likely sell for close to $1 million, despite needing a major renovation. 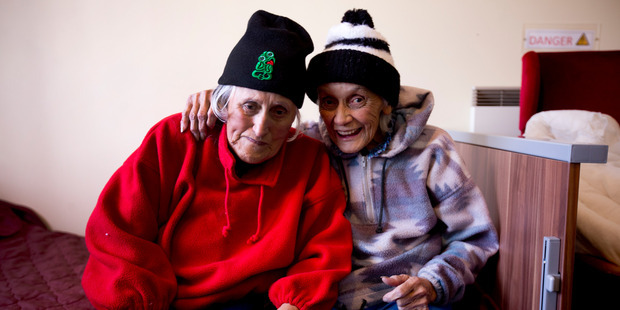 Sisters Rehutai Gundry, 90, and Fay Gundry, 88, lived at the two-bedroom home all their lives until recently moving into a resthome. Their brother Ian Squire, who is selling the 80sq m property at 66 Palmerston Rd, said they are thought to have been one of the first Maori families in the Birkenhead Point area. The house, built as a working man's cottage for the nearby Chelsea Sugar Refinery, featured in local history books A History of New Zealand Architecture in 1991 and Birkenhead: The Way We Were in 1993 because it was the only house in the area in its original state. Until three years ago, the house did not have an inside toilet or shower. The original toilet under the house is still in place, as is a tin tub which was used for once-a-week baths and cleaning clothes. Mr Squire said he used to bathe in water after his five other family members had used it. The small kitchen is also mostly original, apart from a bench installed in the 1960s. "I fought with them when I was young to get electricity, telephone, fridge, all those things," Mr Squire said. The kitchen and bathroom are at the back of the house where views extend over the harbour, and should be "ripped off and extended", Mr Squire said. The walls are lined with scrim, a woven material between the kauri structure and the wallpaper that was popular in older New Zealand homes before plaster was available. It is considered a fire hazard, which Mr Squire said meant he was unable to insure the place. A white picket fence around the house was blown over in last week's storm. The property is heritage-listed, so the new buyer would need to keep the character. "Birkenhead, which is sought-after now, was mainly poor, working class people so it was a very different world," Mr Squire said. "Fortunately, even though there are wealthy people living here now, it still has retained a community spirit. It still has neighbours giving fish to each other, vegetables. " The house was bought by the sisters' parents, WWI soldier Tupoto Gundry and his wife Ngarimu, who died in 1947 and 1967 respectively and were of Ngapuhi descent. Mr Gundry was a descendant of Maori chief Hone Heke. Mr Squire, 69, estimates they moved in 88 years ago, renting before buying, probably for about £100. He is not a blood relative of the family, but came to live with them when he was a baby because his Pakeha mother, who lived next door and was best friends with Ngarimu, already had seven children. "It wasn't common for a white child to be given to a Maori family. And at the time they were the only Maori family living in Birkenhead." The two sisters never married and have developed their own language, which carers at their Northcote rest home cannot understand. A brother, Kenneth, also lived at the home until his death in the 1970s. Stephen Wells of Lochores Real Estate estimated the cottage, on a 519sq m section, would sell for up to $900,000 and that up to $400,000 would be needed to modernise it. The property is to be sold at auction next Sunday.